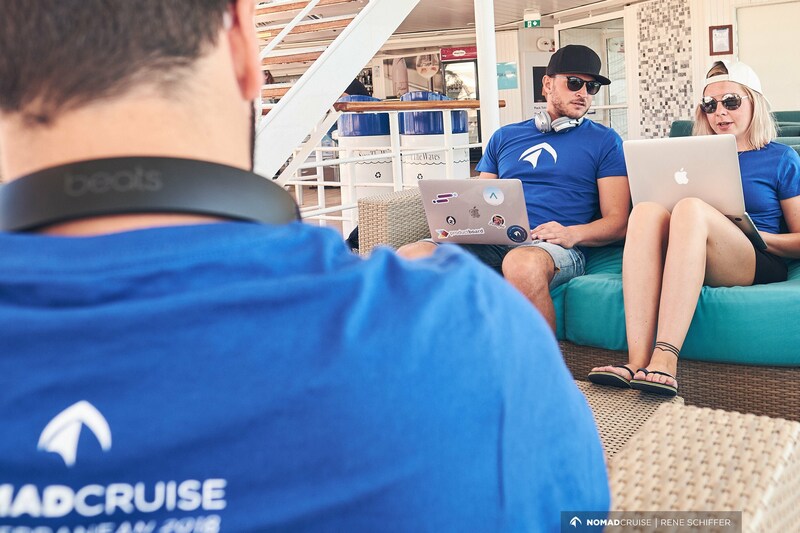 Nomad Cruise condenses a lifetime of nomadism experience into a short space of time and gives you a good idea of what it’s like living a fulfilling life of work and travel. Sure, most nomads aren’t cruising the seas all year round sucking back on mojitos and answering emails in a jacuzzi all day. But there is no better place to learn, share and get inspired by your fellow working vagabonds. You’ve got to network to get work, right? Imagine being apart of a 2 week networking paradise where every interaction you have both inspires and motivates your ambitions. This is the only place you can plan and toast to your future success while either bathed in disco lights or wrinkle-skinned in a jacuzzi while sailing the seas to exotic destinations. Everyone is there to network, inspire, teach and learn from one another. 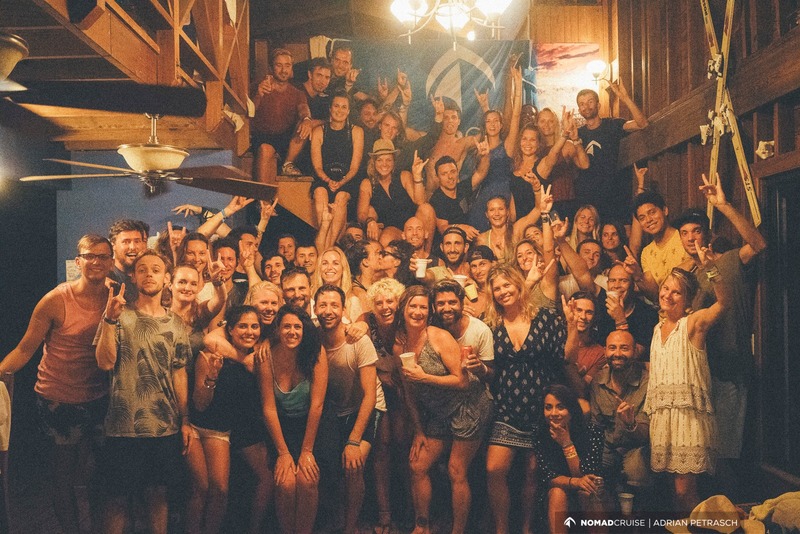 It’s a community of people who truly want you to succeed, because your success is the basis of our close community – we all share in the highs and lows of life as a digital nomad. Whether you’re a social butterfly or a corner lurker you are almost guaranteed to progress yourself and your business. It’s hard not to! The beauty about our conference being on a cruise ship is that everything is arranged for you, there’s no need to worry about a thing. Nobody wants to carry their wallet around a cruise ship and count quarters on the counters at the bar. Awkward. That’s why the cost of your ticket includes ALL the food and drinks. Each night you’re treated to a seated 3-course dinner, each morning a breakfast buffet and everyday there’s a lunch buffet to keep you going in between the super cool daily program. 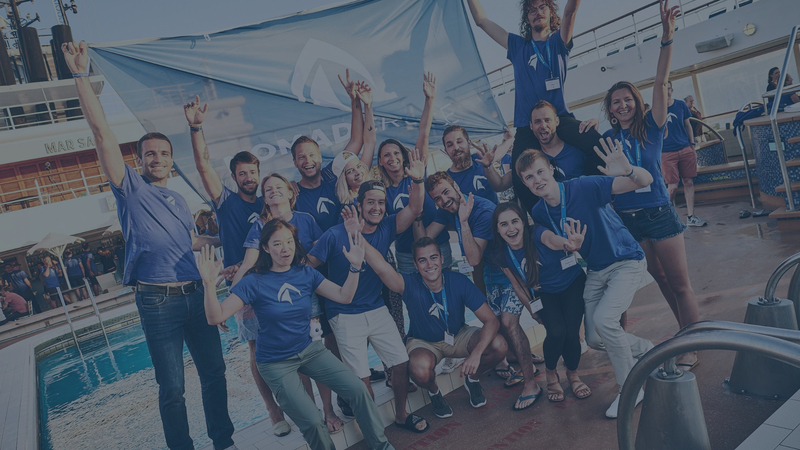 We spend quite some time sourcing and curating speakers from around the world who will benefit our entire nomad community with their shared wisdom, knowledge and experience. We take this very seriously. 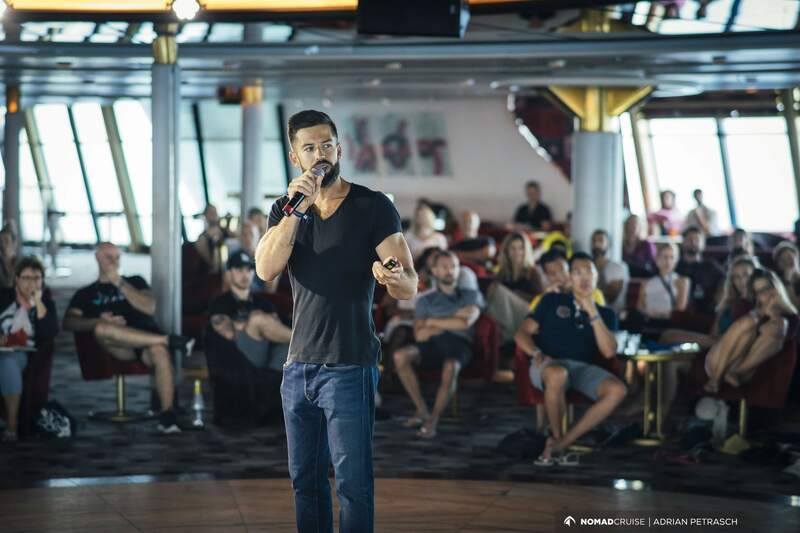 The whole point of Nomad Cruise is to share information in order to help each other grow. We try find the best speakers covering a range of different topics to cater to everyone. The best part? 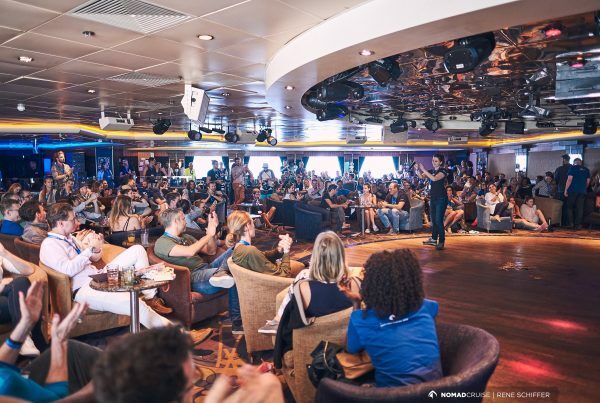 Because the speakers are fellow cruisers you’ll have so much time to spend with them one-on-one or in small groups on the cruise in workshops, meetups, on the dance floor or at the bar. 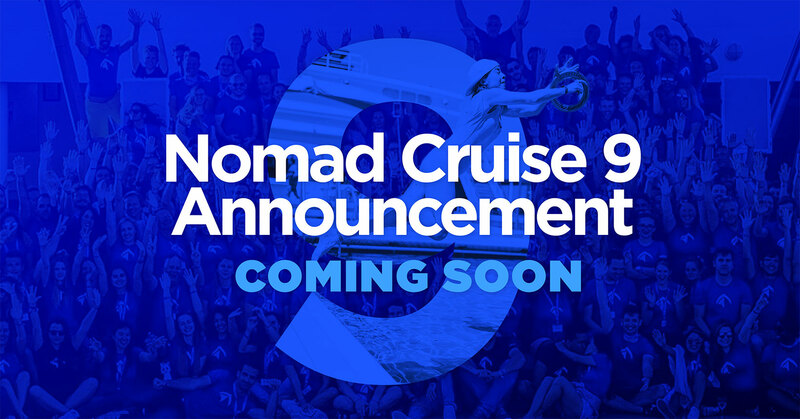 Check out Nomad Cruise 8’s program to get a taste of what you could be in for. Workshops are a great way to get some practical knowledge in a small group from someone who is really amazing at what they do. 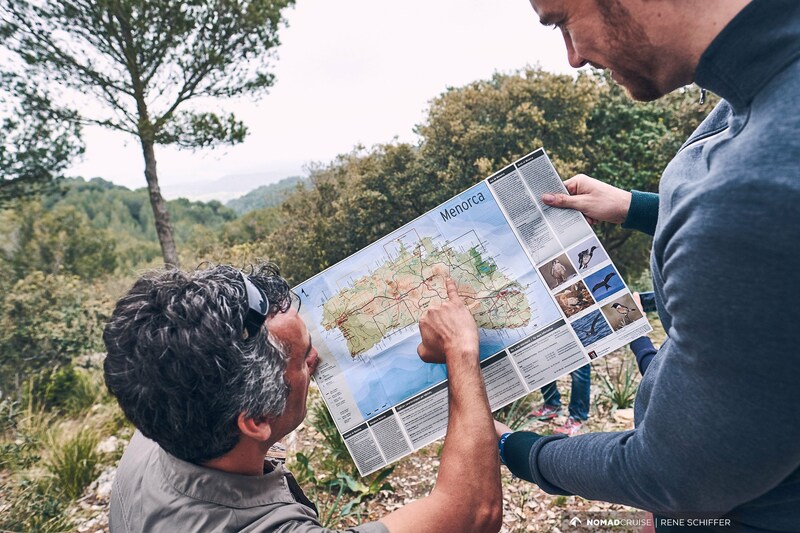 They are primarily group work based so it’s a really valuable opportunity to work closely with your fellow nomads to see how they operate and how well you work together. We try curate workshop leaders who will share practical advice on a wide range of topics to help you with your business and professional endeavours, from how to create killer presentations, how to master your affiliate marketing business, to understand the big deal about Bitcoin and how to create your own chatbot. If our carefully curated program of talks and workshops inspires you to a level where you want more, then don’t stress, we’ve got you covered. 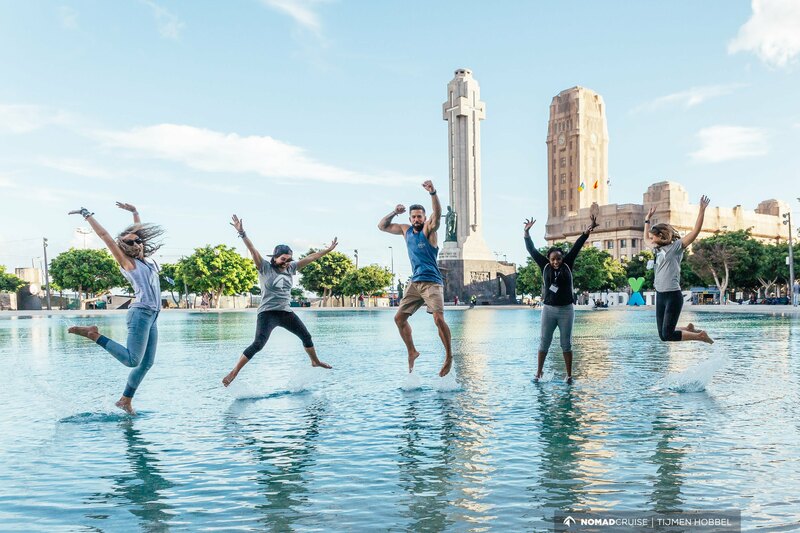 Every member of our cruising nomad tribe is able to arrange an independent and self-organized meetup during the many ‘free time’ slots available. What often happens is that presenters of talks or workshops completely stun their audience with their knowledge sharing that people want more, so they organize a casual meetup over a drink to satisfy your curiosity. Anyone is able to arrange a meetup, so if you have some wisdom or skill that you are wanting to share with the rest of us then go ahead! Our program offers more than our workshops and talks. We have a variety of both official and unofficial gatherings. 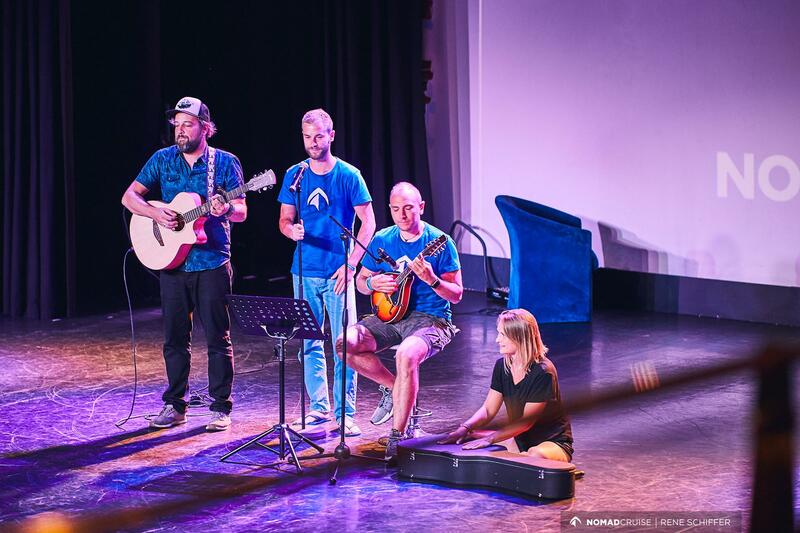 We host our very own talent show, night of failures, jam sessions, ecstatic dance meetups and even salsa workshops. There’s always something special being organised to fill up the time in between workshops and talks. When you need a little break from constantly feeling inspired to take life by the horns, you can choose to join our amazing excursions we set up at each destination we port. We indulge your adventurous spirit by organising a host of absolutely incredible activities which will set your wild side on fire. From walking tours of charming towns and cities, deep sea diving and underwater cave exploring to wine tours, helicopter rides and Jeep safaris, we’ve got you covered. 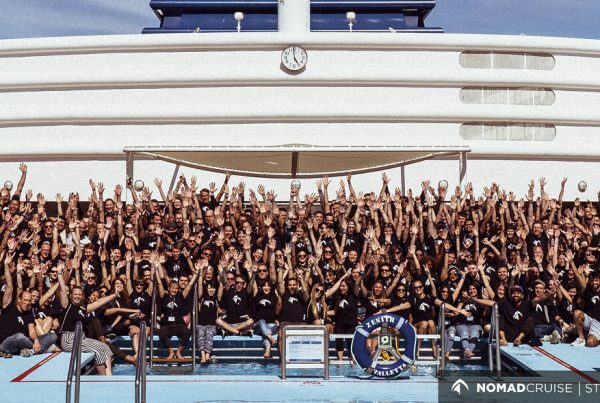 The main goal of Nomad Cruise is to create a space where people are able to connect on a deeper level, share their stories of success and failure, and inspire and motivate each other. It’s an environment where you can share ideas, offer advise and collaborate with people from across the world. Our community is a close one based on mutual respect and the desire to see each other thrive. As you can imagine, this leds to exceptional bonding experiences with like-minded people who share a passion to succeed. 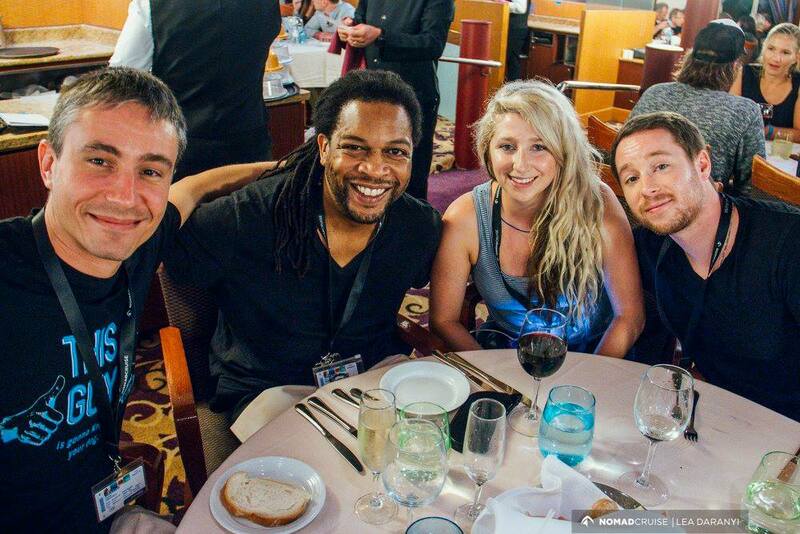 Some of our best friends are people we met on the cruise. Some of our life partners are people we met on the cruise. And some of our business partners are fellow cruisers. Sure, you may be a social media guru or marketing whiz in your home country, but would you be able to make it to the top on your own in a different culture Our richly diverse mix of over 40 different nationalities and cultures on board allows you to be exposed to different ways of thinking and operating. Cultural and social nuances will be easily picked up and understood in an environment which encourages us all to mix and mingle, making lasting friendships along the way. Our differences are what binds us. The more you know the better, right? If you’re playing the digital nomad game of life right, you’ve probably accumulated a bunch of stamps from exotic locations in your passport. Heck, you may have even needed to get a new one. But whether you’re a veteran of the road or just starting your incredibly rewarding life as a nomad, we all have a few more places to visit to cross off our bucket list. 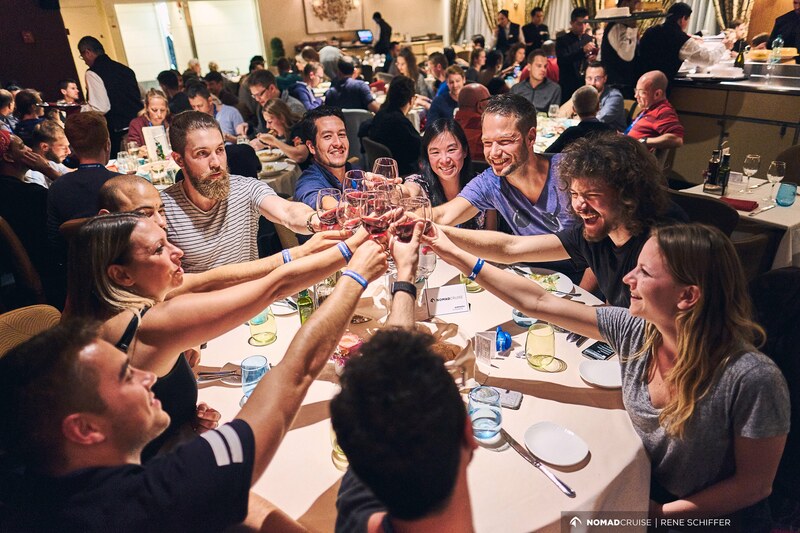 What better way to do that than with a tribe of like-minded and incredible individuals inspired with insatiable wanderlust? For those with an adventurous spirit or even those who struggle saying goodbye (all of us, right?) 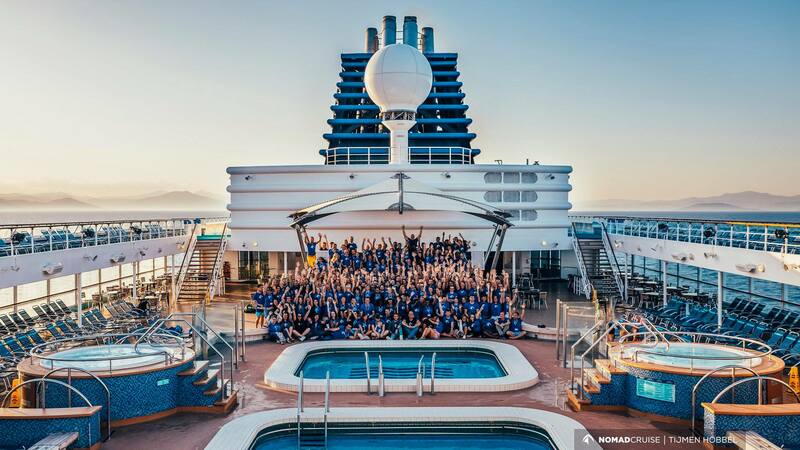 we always plan a Nomad Cruise reunion after we port for the last time at our final destination. This is the perfect way to keep the dream alive, to share stories from the cruise and reunions often inspire continued travels together which can last for months. So best you don’t make any concrete plans for after the cruise. The point is buying a ticket for Nomad Cruise is for life. We organize a bunch of meetups all over the world throughout the year. 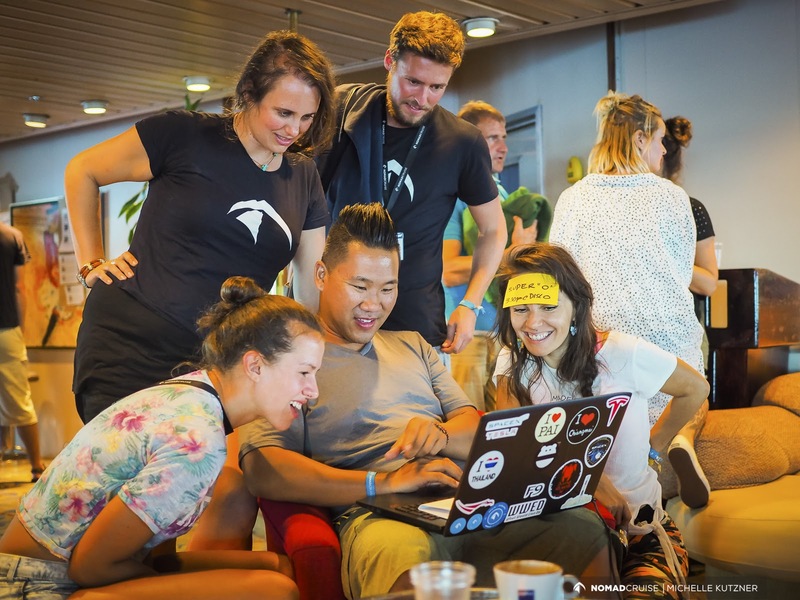 From Chiang Mai to Berlin, Amsterdam to Bali – wherever your journey may take you there’s sure to be a Nomad Cruise meetup close by. The end of the cruise is never the end. There’s always more to look forward to.